Romeo Gutierres– traveled from Mexico to California to be treated for bone cancer. He was twenty two years old. He decided to join some friends who were making a pilgrimage to Lourdes and also to Padre Pio’s friary in San Giovanni Rotondo. Romeo’s friends agreed to help him on this journey. He had an open wound that needed to be cared for. Sometimes he was able to walk with the aid of crutches but other times he had to be carried on a stretcher. The day after the group’s arrival in San Giovanni Rotondo, Romeo waited in the sacristy to meet Padre Pio. Padre Pio had a look of sadness on his face when he saw Romeo. He gave him a blessing. One of the members of the group asked Padre Pio if Romeo could hope for a miracle. Padre Pio answered this question in one word, “Paradiso!” (Paradise) In other words, Padre Pio was telling them that Romeo would soon be leaving his earthly life to begin his eternal life in Paradise. Romeo said that when Padre Pio, frail and suffering, stood in front of him and blessed him, he lost all fear of dying. 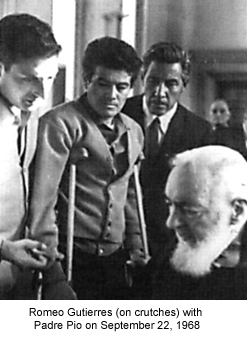 This meeting with Padre Pio occurred on September 22, 1968, just one day before Padre Pio’s death. Romeo returned to Mexico and realized that he had received a great spiritual healing. He was given an amazing deepening of faith and renewed strength and courage. He asked his friends not to feel sorry for him for in his own words he said, “Don’t be sad. Soon I will be with Padre Pio.” Romeo died peacefully three months later. It was in 1964 when the priest, then a young man in his 20’s, accompanied his grandfather on a trip to Italy to visit relatives. The grandfather insisted that they make a stop in San Giovanni Rotondo so that they could visit Padre Pio but his grandson did not want to. The young man had heard that Padre Pio had the stigmata and the idea in simple terms was repulsive to him. It conjured up all sorts of dark and frightening images in his mind. He didn’t want any part of it. Although he had stopped going to Mass, he was enjoying what he considered to be the “good life” which involved many worldly pursuits. Things were going smoothly. He did not need God and he certainly did not need Padre Pio. But he could not convince his grandfather to cancel the trip. They arrived at Padre Pio’s monastery and were told to stand in the sacristy and soon Padre Pio would come in to greet them. Grandfather and grandson stood together in the appointed place and when Padre Pio walked through the doorway the young man was shocked to see the extent to which Padre Pio was suffering. He couldn’t believe it. His heart was profoundly moved and filled with pity. Padre Pio walked up to him and said, “It’s true, your life is going very smoothly right now. Everything seems to be fine.” “I can’t believe it,” the young man said to himself, “He’s reading my mind.” Then Padre Pio continued, “All that is going to change about the time you are ordained to the priesthood. Then God will send many trials into your life.” “Ordained to the Priesthood?” the young man said to himself, “Is he crazy? I’m not interested in the priesthood. I’m not even sure I believe in God!” As he was saying these things to himself Padre Pio blessed him and he kissed Padre Pio’s gloved hand. At once he became aware of a heavenly fragrance. Shortly after this encounter, the disposition of the young man’s heart changed completely and he began to return to the practice of his faith. It was not long before he entered the priesthood and it was shortly afterward that many trials came to him, just like Padre Pio predicted. His esteem for Padre Pio has steadily increased through the years and although he has had many crosses to bear, he feels blessed by God for his vocation.